Dr. Ronconi and his team have been studying Greater Shearwaters since 2005. First, the researchers began to study the diet of these birds in the Bay of Fundy. The Bay of Fundy is a very interesting place because it has the largest tides in the world! The Bay is located between the state of Maine and the Canadian Provinces of New Brunswick and Nova Scotia. The difference between high and low tide, the tidal range, in the Bay of Fundy can be as much as 17 meters! These wild tidal changes mean that lots of water is moving in and out of the bay. As the water pushes in, it brings lots of nutrients and food to the surface; this process is known as upwelling. Two of the Greater Shearwaters' favorite foods, krill and herring, are brought to the surface during the upwellings. The scientists examined how the birds foraged, looked for food, around the Bay. By following the animals' movements, the researchers were able to identify important "critical habitats". Dr. Ronconi explains that critical habitats are, "parts of the environment where animals find a link to their food through physical forces such as upwelling." Before satellite tagging on Greater Shearwaters began, people had speculated that the birds from Canada flew over to England on their migration route. It turns out that these animals stayed in the high seas as they flew all the way to the coast of Brazil and Argentina! The scientists were just as excited as Signals of Spring students! "The first year, we were watching the Shearwaters migrate, we were on the edge of our seats. This will probably turn out to be one of the most interesting parts of our study," Dr. Ronconi notes. These birds face some of the same issues that other seabirds do, on both ends of their journey. For example, oil spills are a major concern. The Bay of Fundy is a major shipping channel for oil going into St. John, New Brunswick. Oil companies also want to build offshore platforms for gas and oil exploration in many places along the Shearwaters' journey. In the event of a spill, the tracking data would tell scientists where they might expect to find these birds. Another important issue is by-catch, particularly as Greater Shearwaters are often caught in fishing nets and hook-and-line fisheries. 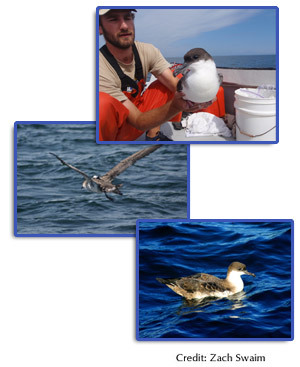 Tracking Shearwaters and other seabirds can help protect the animals. 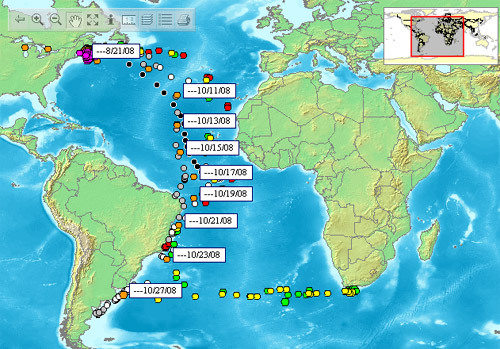 Dr. Ronconi explains, "We can really use this information to identify the critical habitats for conservation, and protection against oil and gas exploration and also fisheries issues."